For days now, since their dramatic June 10 taking of Mosul, Western mainstream media have been filled with horror stories of the military conquests in Iraq of the Islamic State in Iraq and Syria, with the curious acronym ISIS. ISIS, as in the ancient Egyptian cult of the goddess of fertility and magic. The media picture being presented adds up less and less. Details leaking out suggest that ISIS and the major military ‘surge’ in Iraq – and less so in neighboring Syria – is being shaped and controlled out of Langley, Virginia, and other CIA and Pentagon outposts as the next stage in spreading chaos in the world’s second-largest oil state, Iraq, as well as weakening the recent Syrian stabilization efforts. We are told that ISIS masked psychopaths captured “arms and ammunition from the fleeing security forces” – arms and ammunition supplied by the American government. The offensive coincides with a successful campaign by ISIS in eastern Syria. According to Iraqi journalists, Sunni tribal chiefs in the region had been convinced to side with ISIS against the Shiite Al-Maliki government in Baghdad. They were promised a better deal under ISIS Sunni Sharia than with Baghdad anti-Sunni rule. According to the New York Times, the mastermind behind the ISIS military success is former Baath Party head and Saddam Hussein successor, General Ibrahim al-Douri. Douri is reportedly the head of the Iraqi rebel group Army of the Men of the Naqshbandi Order as well as the Supreme Command for Jihad and Liberation based on his longstanding positions of leadership in the Naqshbandi sect in Iraq. In 2009, US ‘Iraqi surge’ General David Petraeus, at the time heading the US Central Command, claimed to reporters that Douri was in Syria. Iraqi parliamentarians claimed he was in Qatar. 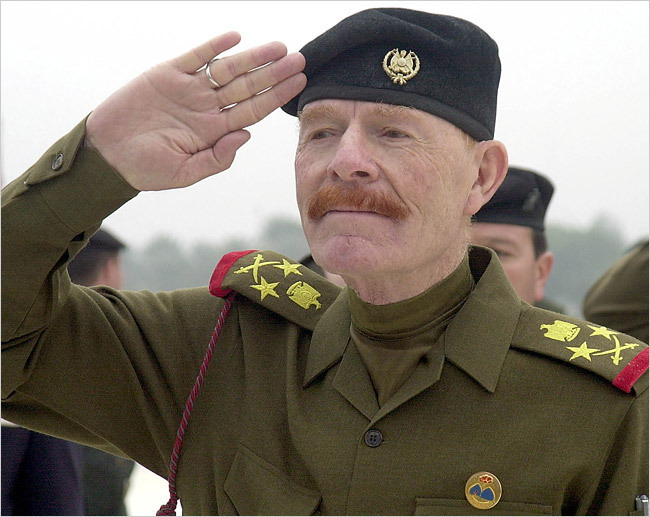 The curious fact is that despite being on the US most wanted list since 2003, Douri has miraculously managed to avoid capture and now to return with a vengeance to retake huge parts of Sunni Iraq. Luck or well-placed friends in Washington? The financial backing for ISIS jihadists reportedly also comes from three of the closest US allies in the Sunni world—Kuwait, Qatar and Saudi Arabia. A top commander in the Sunni insurgency in Iraq has told The Telegraph how his men are fighting alongside Isis to take Baghdad, even if it means pushing the country to civil war. Sheikh Ahmed al-Dabash, 47, a founder of the Islamic Army of Iraq, who fought the allied invasion in 2003, has told The Telegraph how thousands of his men are participating in the Isis-led insurgency that swept across northern Iraq, and which now threatens the gates of the capital. The Islamic Army, however, does not share the same extremist ideology of Isis, Mr Dabash said, and raised the prospect of his faction one day turning its guns on their jihadist comrades. “Isis are an important part of what we are doing, but I can’t say I can 100 per cent bring them under our wing,” said Mr Dabash. This entry was posted in Espionage & Secret Agencies, Imperialism & Colonialism, War & Terror and tagged CIA, Iraq, ISIS, Izzat Ibrahim al-Douri, NATO, Syria, USA. Bookmark the permalink.